As so often happens in the fog of war, cases of mistaken identity abound and it is with this that we begin this article when on 10 January 1941, Italian Ju.87s of 96° Gr. B.aT. led by Capitano Ercolani crippled the HMS Illustrious, knocking her out of the war for more than a year. According to Historian Mattesini [1,3], the best description of the attack on the "Illustrious" and the damage reported by the aircraft carrier can be found in "Red Duster, White Ensign, The Story of the Malta Convoys" . According to the Superareo daily bulletin of January 10, 1941 - translated from German by a liaison office at the command of the X Fliegerkorps in Taormina, the first Luftwaffe attack took place between the hours of 12:40 and 12:50 hours, with the main objective the "HMS Illustrious". Forty Ju.87s of I./St.G.1and II./St.G.2 commanded by Lieutenant Colonel George Edert and Major Walter Enneccerus took off from Taormina. Thirty Ju.87s were armed with anti-ship bombs of 1000 kg and thirteen other aircraft of the second group, in order to increase their range, were loaded with single bombs of 250 kg. None of the participants of the first group of German planes which attacked the British carrier 65 km south of Pantelleria, possessed bombs of 500 pounds. 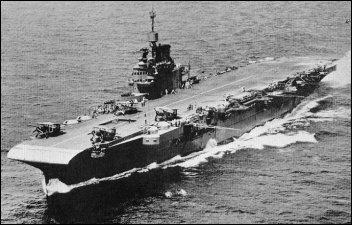 Had the "Illustrious" been hit by five or six anti-ship bombs of 500 kg - in addition to the 1000 kg bombs, which pierced the armoured flight deck, the carrier probably would have sunk. However, since the remainder of the second group of Stukas only had 250 kg bombs, the damage inflicted on the carrier was modest, the bombs exploding on the deck but did not do enough damage to put at risk the loss of the ship. It is also very likely that a second bomb of 1000 kg had also struck the Carrier", according to the German bulletin. The bulletin also states in addition, two bombs of 250 kg also fell close to the aircraft carrier. So, on the German side, the result of the attack was a total of six hits scored on the "Illustrious". The Illustrious had been hit but was able to get underway, escorted by the destroyers "Hasty" and "Jaguar" and protected by the rest of the group, heading eastward, trying to reach the Maltese port of Valletta. At 13.30, the ship again came under attack unsuccessfully though, by a formation of 17 German HE 111 bombers of II./KG.26. 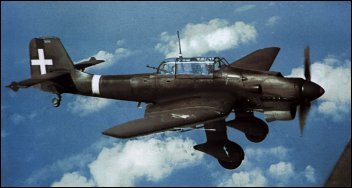 Also participating in the attack were five Italian SM.79 torpedo bombers of 279a Sq. At 15.30 the "Illustrious" was able to repair damage to its rudder, control fires and increase its speed to seventeen knots. The ship had been damaged but was still able to sail towards Malta. Next, it was the turn of the Italian Stukas, which were responsible for the serious damaging of the ship that knocked her out of service for more than a year. The first attack by six Italian Ju.87s that took off from Comiso, was led by the Commander of the 96th Bombardment Group Captain Ercolano Ercolani, and Serg, Magg. Bortolotti escorted by eleven CR.42s of the 156° Gruppo Caccia Terrestre, under the command of Captain Luigi Filippi. Six Stukas (five from 237a Sq. 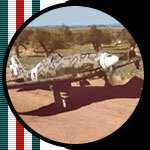 and one of the 236a Sq. ), which were detected by the radar of the battleship Valiant attacked the carrier under heavy flak at 16:00 (16:10 in the British reports). They came in from the starboard bow and struck her on the right side amid ship, with anti-ship bombs of 1000 kg and two more bombs of the same weight, that fell close to the aircraft carrier damaging the hull. It should be noted, as is evident from a report of the Air Force Command in Sicily sent to Superaereo, that the bombs used on this occasion were 1000 kg bombs available at Comiso. According to what was reported in the document "Summary No. 18 Battle of the British Admiralty, the commander of the Illustrious", Captain D.W. Boyd, wrote that the attack by the Italian Ju.87s was believed to be German Ju.87s - a case of mistaken identity! Evidently Boyd was wrong and Cameron added that the damage from these last attacks was very serious, the large bombs hitting the rear elevator lift, penetrating it and causing massive explosions inside the hangar. Fires were started everywhere and were difficult to control. The ship limped to Malta for temporary repairs and eventually sailed to Norfolk Virginia for major repairs. The Illustrious returned to active duty 12 months later in 1942. British casualties were 126 dead and 91 injured. The disabling of the HMS Illustrious on 10 January 1941 had long been credited to the Luftwaffe.